Section 1 The physiology of sleep. NREM-REM sleep. Section 2. An overview of polysomnography. Multiple sleep latency test. Maintenance of wakefulness test. Actigraphy. The Oxford sleep resistance test. The cyclical alternating pattern (CAP) in human sleep. Scalp topography and cortical generators of the spectral components of the cyclical alternating pattern (CAP). Quantitative analysis of the sleep elctro-encephalogram. Evoked potentials during non-REM sleep. Section 3. Epidemiology of sleep disorders. Narcolepsy. The syndromes of excessive daytime sleepiness. Obstructive sleep apnea. Central sleep apnea. Neuromuscular disorders. Arousal parasomnia. REM behavior disorder. Sleep and dementia. Nocturnal manifestations of waking movement disorders - focus on Parkinson's Disease. Restless leg and periodic limb movement in sleep. Sleep and epilepsy. Sleep-related erections. Primary insomnia. Psychiatric insomnia. Circadian rhythm sleep disorders. Sleep and headache. Sleep and autonomic nervous system dysfunction. 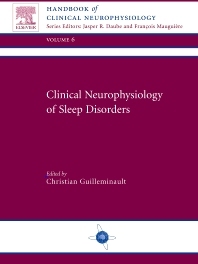 This volume in the Handbook of Clinical Neurophysiology series defines the role of clinical neurophysiology in the study of disorders of sleep. It includes the physiology of sleep, and the role of clinical neurophysiology in assessing sleep with common and less common methods of testing. The epidemiology of sleep disorders and the wide range of neurophysiologic abnormalities associated with them are described, including disorders associated with other neurologic diseases. The ultimate reference source for clinical neurophysiologists on disorders of sleep. Volume in a prestigious series published in association with the International Federation of clinical Neurophysiology. International contributor list drawn from around the world. Discusses physiology, techniques used in clinical neurophysiology, and disorders of sleep.